You can create a flash briefing skill to provide Alexa customers with news headlines and other short content. Typically a flash briefing becomes a part of a customer's daily routine. A flash briefing provides a quick overview of news and other content such as comedy, interviews, and lists. A flash briefing skill provides content for a customer's flash briefing. The flash briefing skill API defines the format of content and enables you to create flash briefing skills. Customers discover and enable flash briefing skills in the flash briefing section under settings in the Alexa app, or by searching for "flash briefing" in the skills section of the app. Customers can also enable their favorite provider through voice, the first time they listen to flash briefing. When you create a flash briefing skill, you have a chance for your original content to reach customers daily. Update your content at least daily, and you can make changes as often as every 15 minutes. Alexa caches your content to ensure optimal performance and minimal latency for customers. You can create a flash briefing skill if you own, or have the right to distribute, original text or audio content that updates frequently. You should understand web technologies and have the ability to configure HTTPS, RSS and/or JSON content. 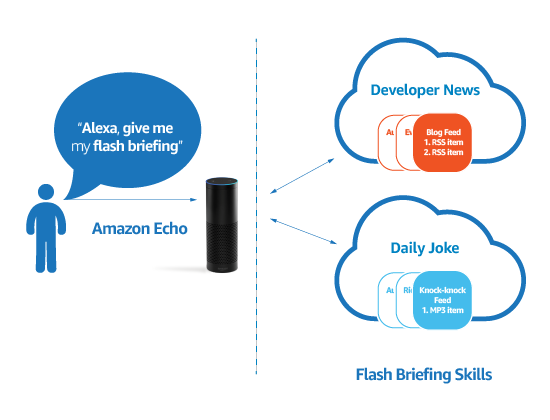 The voice interactions for a flash briefing skill are defined by Amazon, but you must be able edit the format of your content so that the flash briefing Skill API can understand it. An Amazon developer account. You can sign up for free. An Alexa device or app such as Amazon Echo, for testing purposes. Knowledge of RSS and/or JSON, and skills to modify your content to fit the flash briefing Skill API format. The flash briefing skill submission process provides the steps to submit descriptive information about your skill and configure one or more feeds for each skill. You can then test your skill in your Alexa-enabled device and provide additional information about how you handle customer data and privacy. Once you've provided this information, you can submit your flash briefing skill for certification and use by customers.